Everyone can make a difference with a planned gift. 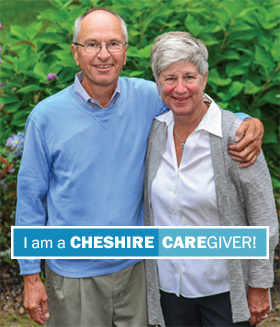 When you name Cheshire Health Foundation (CHF) in your estate plans, you give meaningful financial support that lasts beyond your lifetime, and you help ensure our future ability to deliver state-of-the-art health care to our community – your neighbors, family and friends—care that is compassionate and of the highest quality possible for every patient, every time. Click here for Planned Giving options. My wife, Suzanne, and I have lived in the Keene area for more than forty years and have raised two children here. In that time, we have utilized Cheshire Medical Center/Dartmouth Hitchcock Keene for ourselves, our children, and parents. Because the Medical Center has always been here, we expect it will always be here in the future. But that is not a given without support from a broad base of people in the region. What many people may not realize is that the Medical Center is a nonprofit organization. It is not a for-profit corporation, nor does it have stockholders as other medical facilities may have. We are the “stockholders” of our hospital — the people in the region who rely on it for medical care. The beginnings of the hospital can be traced back more than 120 years to the philanthropy of people within our local towns who envisioned the need and benefits of having a local medical facility. Their vision, and the planned giving of generations that have succeeded them, have both helped to grow and sustain our area’s medical facility. By taking the relatively simple step of including Cheshire Health Foundation in their estate planning, they have provided the Medical Center with the capability to invest in attracting first-rate doctors and staff. Philanthropy continues to be a significant factor in the Medical Center’s ability to invest in the latest technology to provide the most up-to-date and effective treatments and to have a facility that meets the needs of the community. For these reasons and many more, Suzanne and I made the decision to include Cheshire Health Foundation in our estate planning. We believe it is important for the economic health of the Medical Center and its ability to provide the best in health and wellness services. There is an old saying, ‘you don’t know what you’ve got until it’s gone.’ With all the financial turmoil in the field of health care, support from all of us is essential. We encourage you to include Cheshire Health Foundation in your estate plan as generations before us have done. Whatever the amount, it will be a legacy which will touch the life of nearly every person living in our region. What many people may not realize is that the Medical Center is a nonprofit organization.